For many, the appeal of running is its simplicity: No elaborate gear, expensive memberships, or specialized playing fields are required—just lace up and go. Yet for a sport that’s so simple, there may be none other that demands such an intricate blend of stamina, self-reliance, and grit. That’s certainly true for ultrarunners—those who tackle distances much longer than the standard 26.2-mile marathon and endure often-brutal terrain and weather. Meet four of Western North Carolina’s most elite runners, who, altogether, have logged tens of thousands of miles across all 50 states and every continent. Though what drives these athletes beyond the edge isn’t medals or glory; instead, they’ve discovered that the essential ingredient to going the distance is to serve a greater good. Peter Ripmaster may or may not be the most gifted ultrarunner, but he’s probably the most earnest. He comes across that way in person and also via e-mail—like when he wrote to the Iditarod Trail Invitational race director in 2013 to sign up as if it were a neighborhood 5K, rather than one of the planet’s toughest ultramarathons, stretching 350 miles across the Alaskan tundra. The 50 available spots in that elite run-or-bike race are usually filled by invitation only, but so passionate was Ripmaster’s petition for a slot that the director gave him a shot. While his intensity has pushed Ripmaster to plenty of finish lines, it’s been fuel for managing despair, too. A talented high school football and baseball player from the suburbs of Detroit, Ripmaster slipped into a pattern of heavy drinking as a college student, and life got worse after he lost his mom to cancer when he was 24. His father, who has also passed, battled prostate cancer. After spending several years in Telluride, Colorado, Ripmaster and his wife, Kristen, moved to North Carolina, her home state, where he pieced his life back together. One day in 2008, he looked at his wife and said he wanted to run a marathon—immediately. “I was overweight and out of shape, but she knows better than anyone else that if I want to do something, to not get in the way,” he laughs. Kristen dropped him off on the Blue Ridge Parkway with a pair of running shoes, cargo shorts, and zero training. Ripmaster ran 13.1 miles from Asheville to Mount Pisgah and back. It was brutal, but he loved it. He was hooked, and over the next five years, ran 50 marathons in 50 states, raising more than $60,000 for cancer research to fulfill a promise he made to his mother in her final days. Still, Ripmaster says he was looking for something deeper, bigger, more intense. Last year, he ran the 350-mile Iditarod again, knocking four days off his time and finishing third. And in February 2016, Ripmaster was just one of five runners invited to attempt the much lengthier, 1,000-mile Iditarod route. In a harrowing river crossing that sent him plunging into 50-below-zero rushing water, Ripmaster managed to escape the rapids and ran his fastest four miles to the nearest checkpoint. Despite the near death experience, he pressed on to reach the 500-mile mark before dropping out of the race. In retrospect, it’s not about placing, he says. For his effort, he raised over $13,000 for Hope Chest of Western North Carolina to support women living with cancer, and says he intends to race in the 350-mile Iditarod next year. While such lengthy runs often include pits of despair, they’re accompanied by moments of euphoria. Ripmaster, who has struggled with depression, says those highs and lows on the trail are precisely why he runs. For a sport as solitary as long-distance running, it may be a surprise that what Franklin resident Sarah Lowell prizes most about it is the people. “The ultrarunning community is very tight-knit; I love the camaraderie of the people in the long races,” she says, even if the race-time encounters are fleeting. In one Arctic race, Lowell encountered just three other people along the route. At the same time, long, remote races are where she’s thrived. Lowell has built a career running some of the most extreme footraces on the planet. At 53, the retired elementary P.E. teacher has been running races for nearly four decades. It began with a two-mile cross-country race as a high-school junior in south Florida after a coach encouraged her to give it a shot. “It’s turned out to be one of my major niches in life,” says Lowell, who recalls she agonized through her first competition and was sore for a week. She says she’s a person who needs to be constantly on the move, which in her case is something of an understatement. Four weeks after her first track meet, in 1979, she ran a marathon. Since then, she’s cracked a three-hour marathon (average time is four and a half hours) and amassed a garage full of awards and belt-buckles—the universal prize for finishing a 100-mile race. She can run in any climate, it seems, also dominating ultra races in the Arctic Circle, where unwavering determination is as important as pure running ability. On a whim, she decided to run a race in Alaska. She did well and loved it. Over the next decade, Lowell earned the nickname “the Polar Princess” and led the field in extreme Arctic ultrarunning. In 2008, she also completed the world’s hottest ultra, the Badwater 135-mile race in Death Valley. What’s her secret? “Every chapter of racing, I’ve been motivated by something more than just running. When I have that motivation, I have so much confidence,” Lowell asserts. Early in her extreme polar career, one of the payoffs was a dead of night experience witnessing the dazzling green and pink lights of the Aurora Borealis. For the past two decades, almost every race Lowell has participated in has raised funds for a charitable cause. Yet, it wasn’t until she raced on behalf of a student suffering from a rare form of childhood cancer that she ran for a very personal cause. She ran the Arrowhead 135-miler in 2007 and ’08 while pulling a sled she dubbed the Daniel Polar Express. Motivation: Harlan’s nonprofit, Barefoot Seeds, helps Tarahumara runners and farmers in Mexico grow corn and save seeds that are essential to their survival. See www.barefootseeds.org. Some people get chased by police officers, but Will Harlan goes after them. Well, one of them anyway: his dad. As a boy in Missouri he often dashed after his law-enforcing father on his ritual neighborhood jog. Harlan kept on running, competitively in high school and as a college student at Emory in Atlanta, but the congested roads steered him onto local trails and into the emerging competitive trail-running scene of the 1990s. He enjoyed it enough to lace up for an 18-mile race in the late ’90s hosted by the Nantahala Outdoor Center. To his surprise, he won. “I threw myself into trail running at that point,” says Harlan, who’s also the editor of Blue Ridge Outdoors magazine and author of an award-winning book, Untamed: The Wildest Woman in America and the Fight for Cumberland Island. Since then, the 40-year-old has won plenty of races. Most notably, he holds the speed record along the 72-mile crest of the Smoky Mountains National Park and has taken gold at the storied Mount Mitchell Challenge five times. The grueling 40-mile event summits the East’s highest peak, often in tough winter conditions. In the early 2000s, Harlan was at the top of his game and wanted to get better. That’s when he came across a magazine article about runners from a remote canyon in northern Mexico who dusted their elite opponents in the Leadville 100 wearing merely a pair of homemade goat leather sandals strapped to their feet. “I decided I had to meet them and find out their secrets,” says Harlan, who set out for the Copper Canyon without a guide and knowing no Spanish. The region is home to roughly 50,000 members of the Tarahumara tribe who have an uncanny ability to run long distances throughout the canyon. “Here I am, this cocky young trail runner thinking I could tackle anything that came at me,” recalls Harlan, who set out on a long run in the rugged desert canyon and got horribly lost. A young Tarahumara boy led him to safety, and as a result, Harlan got to know his family and a group of people that scrape by living simply off the land, in a place where the terrain is difficult and conditions dangerous due to drug trafficking. He was so impressed, in fact, that Harlan has since modeled his own life after their simplicity, self-sufficiency, and ruggedness by operating an organic, off-the-grid farm in Barnardsville and establishing a nonprofit, Barefoot Seeds, to aid the Tarahumara’s endangered way of life. 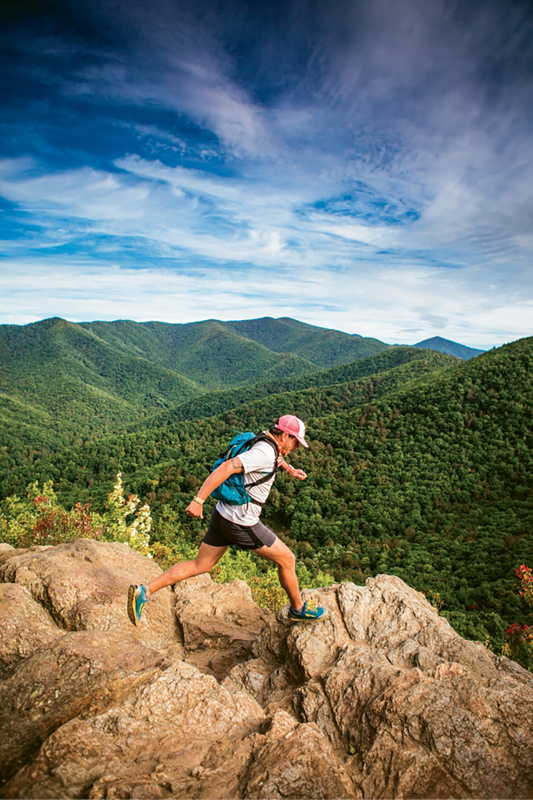 Last September, Morganton physician and runner Doug Thompson found himself scrambling up a rock face in the Carpathian alps during an obscure 62-mile run in Romania that began at Dracula’s Castle. “I was way out of my comfort zone,” laughs Thompson—but like all of the 28 ultramarathons on all seven continents he’s started, he managed to finish. In fact, the Cleveland native has logged plenty of miles in tough settings: 110 degree heat during a five-day race across the Atacama Desert in Chile, 20 below at a North Pole marathon, or huffing it at 13,000 feet in the Peruvian Andes. His toughest run may have been his first: In 2002 he was 34, and like many first-time marathoners, a Leukemia and Lymphoma Society postcard wooed him to train for a 26-miler and raise money for the cause. At the time, Thompson had just lost a patient he admired and decided to run in his honor. “I’ll just do it to see if I can,” he recalls of the race in Nashville, Tennessee, in which he plodded to the finish line, completely out of fuel. “I hit the wall, and it was tough. I thought it was an experience I didn’t want to go through again.” But a month later, with his blisters healed, he yearned for another go at it. Before long, Thompson was addicted. As his passion for logging long miles took hold, Thompson steered his medical career to treating cancer patients, eventually landing with an oncology practice in Morganton and Valdese. For Thompson, each run, from the training dashes in the woods near his home to the grueling ultras, is a respite from the reality of treating patients, some with grim prospects. That’s made his pastime of running three to four ultras per year across the country and around the world not just a personal passion, but an essential release. Since that first marathon in Nashville, he’s completed a marathon in every state of the union and on every continent while also finishing an impressive tally of triathlons, including the Ironman in Hawaii. Running has also given Thompson, who is often accompanied by his wife and two teenage children on running trips, an opportunity to visit some of the most remarkable places on the planet, such as a recent trip to Peru, where he completed the Inca Trail Marathon that finished at Machu Picchu. He says it was one of his toughest, and far from a record performance. But, as always, he reached his destination.